I’d seen It Looked Like Spilled Milk listed as good book to use for teaching kids yoga so I decided to give it a try. The book went over well with the kids. I think one of the reasons it works well is that it leaves a lot up to interpretation by the kids. The class interjected periodically when they thought the picture looked like something else entirely. You can then riff off of what students find and have them get creative with taking the shapes that they see in the pictures. Rabbit: Try bunny breath (big inhale, three bunny sniff exhales through the nose). Take hops in a squatting position with hands up as ears and a forward bend with floppy ears (shaking head and arms). Kids can also be rabbits in a hutch (kneeling with head rounding to knees, hands on heels). Bird: All kinds of options here. Try making bird wings with the arms and balancing on one foot with the other knee bent and foot up towards standing leg. Or fly around the room and land in airplane (warrior three) pose back on your mat. Be a squatting bird or a bird flying south (half moon pose). Tree: Go beyond the basic tree pose and ask kids what kind of tree they’d like to be (i.e. cactus, palm, swaying tree, etc.) or what they think the tree in the picture might look like. Ice cream cone: Start off with your ice cream cone by standing with arms out in a “V” shape. Then bring hands together and slowly scoop your ice cream as you roll down into a ball and roll all the way down to the back and then back up to your standing “V”. Make it a double or triple scoop by taking another roll. One of my students decided that she’d slowly melt down from her “V” all the way down to a puddle on the mat. Pig: Pigs often roll around in the dirt. Roll kids up in the mat like a pig rolling in its sty. Get a curly pig’s tail by crossing the legs and coming into a laying-down spinal twist. Birthday Cake: Bake a cake with a partner by taking a wide-legged seated position with feet connecting to the feet of your partner. Add various ingredients, reaching forward and over to the sides in your forward bend. Mix the cake by taking your partners hands and circling around, using the pull from your partner to come forward and back. Put the cake on the oven rack (legs up to table top, modified boat pose). When oven dings, take the cake out and frost it (stretching out into forward bend). Then of course, eat it! Sheep: Walk on all fours. Sheep often move in herds so you can make a herd of sheep with each student holding onto the ankles of the person in front of them to make a big line. One student can even be the sheep dog (downward dog) to guide the herd. Owl: Take owl pose (squatting on toes with hands clasped behind the back, arms reaching back). Get still, turn your owl head from one side to the other. Let out a hoot or a little jump, landing back on the toes. Mitten: Take wrist stretches by bringing fingers together, then turning the hand open and stretching one finger at a time. Bring the arms out to a “T” shape and then one finger at a time, make a fist with the hand to test out each finger of the mitten. Squirrel:We tried bounding like a squirrel, hopping the feet to hands from downward dog and then taking hands forward.This one is very open for interpretation, however, and my students had some very different ideas of what a squirrel pose might consist of. Angel: Make a halo with hands interlaced overhead, rise up onto toes and float on tiptoes, perhaps flying around the room. If timing works out, the end of the book makes a great segway into final relaxation. 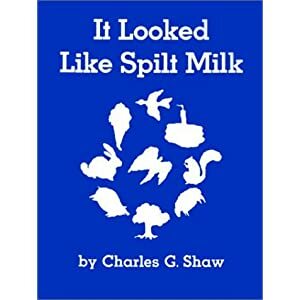 The spilled milk is revealed to be a cloud. You can take kids through a floating like a cloud visualization as they come into savasana/ending quiet time. Other ideas? I’d love to hear ’em! Yup, it was inevitable that a penguin nut like me would do a penguin theme one of these days with my kids yoga class. I taught this theme to a few different classes this week and thought I would share some of my class ideas. Walk like penguins! Waddle around with webbed feet on your heels and flap your flippers. Or, as one child pointed out to me, penguins have to move their feet mostly together, so you can hop around with feet together or try to walk this way, inching the feet forward. When penguins are excited to see each other, they flap their flippers and let out a big squawk. Kids can take a deep inhale and exhale out a big squawk when they encounter other penguin friends. Penguins build nests and when they lay eggs they keep them warm by holding them on their feet so their feathers can warm them. You can practice balancing a small ball on the feet while staying very still in a squatted position. Penguins sometimes have rocks to waddle around. Several children can be rocks by coming into mouse pose with a little bit of space between each child. Have several others be the penguins and waddle around the rocks. Then switch so penguins become rocks and rocks become penguins. Have children be the frozen icicles in Antarctica by bringing hands together overhead, interlacing the hands and reaching pointer fingers up. Become a jagged iceberg by leaning from one side to another. Imagine the sun coming out and slowly melting the ice into a puddle while kids slowly lower to a squat, then all the way down on the mat. You can also make a big iceberg with a partner by facing each other with hands together and making an arch like the tip of an iceberg. 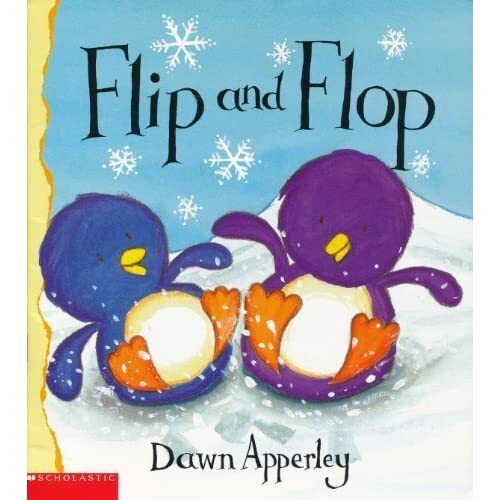 There’s a ton of penguin kids books out there, but the one I used, Flip and Flop by Dawn Apperley, is a great choice. We did a number of penguin activities along with the book. Just like the Flip and Flop, we played “Boomba” where on the count of three everyone jumped and yelled, “Boomba”, then rolled down like a ball onto the back and then all the way back up. For an added challenge, we tried a “no hands” Boomba. Another game the penguins play is sliding down the ice. Everyone made a slide (purvottanasana, which looks like a reverse plank pose). I went around with the little penguin in the picture above (who is on the round side) and rolled the penguin down each child’s “slide”. And of course, penguins go swimming! Stand at the back of the mat to get ready to dive in. Reach flippers up, then slide all the way down through a forward bend and onto the belly. Swim by lifting up and bringing flippers back. Kids will get creative, maybe wiggling forward as they swim or bringing the arms out the side and then bringing them forward and back to steer themselves along. Come out of the water by pressing up into the hands and walking or hopping the feet forward to the front of the mat and stand on land again. For older kids, you might try the book The Emperor Penguin’s New Clothes by Janet Perlman, which tells the classic story of the emperor’s new clothes only with penguin characters. I haven’t had a chance to try this one out yet on a class, but it strikes me as a good one for exploring the themes of the story and how this relates to yoga (speaking the truth, humility, danger of putting someone up on a pedestal, etc.). More penguin pose ideas? Do share them here. I recently did a yoga class with elementary school students where we went to the circus. Elephants: Warm up with elephant pose as you interlace hands together into a forward bend letting head and neck hang. You can lift their trunk up then down again to eat peanuts or take a shower and walk around with heavy feet. Unicycle: Laying down on the mat, bicycle the feet. Or start bicycling from a seated position (trying with no hands) pedaling forwards and then backwards. For even more challenge, try pedaling all the way down, then back up to sitting. Did you have to focus especially when you changed what direction you were pedaling? Lions jumping through a hoop: Take a few rounds of lions’ breath, then stretch up into downward dog. One at a time, everyone can jump through a hula hoop by placing hands on the other side of the hoop and jumping the feet forward from downward dog. How did different parts of your body have to work together to help you make it through the hoop? Tightrope: Walk heel to heel along the edge of your mat or along a strap or string. At the end of the “rope”, take a balance pose. This could be dancer pose, airplane, or bringing a knee up and then extending the leg straight. Combine different balances together for a more difficult balancing routine. And of course there’s walking backwards to where you started. What did you have to do to help you keep your balance? What helped you keep your focus? Juggling: Sit in a circle and quickly pass a small ball around the circle. Then start passing a second ball of a different size in the opposite direction and see how well the group can work together to “juggle” the balls going around. How can you still keep your focus when two different balls are going around? Trapeze: With a partner, face one another and hold onto each other’s arms and take airplane pose. Come up and take a partner chair pose while facing your partner and holding arms. You can try this with other partner poses with one partner leaning forward and the other partner gently pulling their arms back to give a chest and shoulder opening or making partner table. Notice how you had to work together to help your partner (and you) balance, stay safe, and enjoy the poses. Another way to be a trapeze artist is to use a wall and take upside-down “L” pose. Feel how being upside down challenges your balance and focus in a different way. Magician’s hat: Wave a colored scarf over a top hat and turn it into a rabbit. Everyone can then take rabbit pose and/or practice bunny breath. You can also pull out multiple scarves from the hat for some creative movement using the scarves. Circus music could go well with these activities. Be sure to ask your performers as they may have some great ideas for some acts to add to the circus. I’d love to hear any further ideas you have for a circus-themed yoga class. I decided my last kids yoga class of October would be a Halloween theme. They got such a great kick out of all the decorations that were up at the yoga studio that I thought some Halloween yoga to go along with it was in order. I incorporated some of the great ideas from Yoga in My School along with my own brainstorms. Skeleton Warm-up: Warm up each body part by shaking each part of the skeleton (fingers, hands, wrists, etc). Walk through the doors: two kids make a house by facing each other and bringing hands together making an arch like the top of the house, then everyone else walks underneath. See spiders inside: Walking like a spider in crab walk or downward dog; can move hands and feet to weave a web. Stumble upon mummies: Lay on your back with arms crossed over the chest, legs straight. Pop up with the torso to sitting, then come to standing without using the arms. Have everyone become a mummy by rolling each child up in a yoga mat. You can even let them escape by unwinding themselves and starting to mummy walk by walking with straight legs and arms reaching straight out. But the best part was “The Monster Mash”. Everybody mashes until the music stops and then freezes in a yoga pose. And of course, we ended with corpse pose. I hope that gives you some great ideas for some kids Halloween yoga. One little girl claimed it was the best Halloween party she’s ever been to. Or was that me?